O-Scale Shack Pack - THREE scale structures included in this kit! One shack uses "tar-paper", the second uses clapboard and the third scribed siding. Mooney's Plumbing Emporium Originally called the "8-Ball Locomotive Works" years ago this new kit from Bar Mills measures 4.5" wide by 9" long. This is a small but HIGHLY detailed kit. Not recommended for the novice modeler! Jebediah's Carriage & Wheel Repair This is a fun and simple kit. The multi-angled roof line adds interest and dimension. The front door may be left open to detail the interior. Kit includes both the structure and ore wagon. Measures 7.8" long. 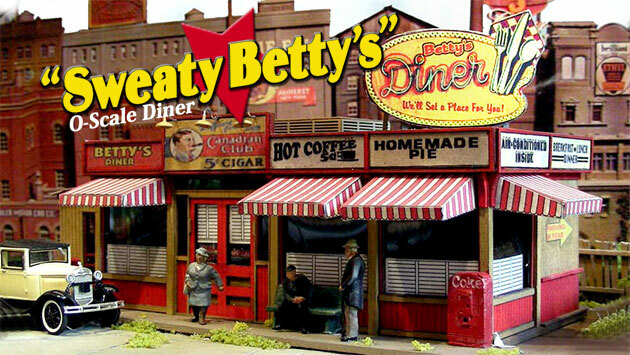 Swanson's Lunch Stand O-Scale. Easily built, this kit comes complete with some interior details, some castings, and the billboard as shown. Town Line Tire & Battery - The NEWEST in O-Scale laser cut kits! This structure typifies the kind of small business that could be found any where in rural America in early to mid-1900's. Structure contains laser-etched walls & windows, resin and detailed castings, and a variety of color graphics. O-Scale Hinkle's Package Store - This little "package store" comes complete with everything from window signs to a fire hydrant. Simple, quick & fun to build! The figure does not come with the kit. .. but anything from the mailbox to the sidewalk does. Store measures approximately 3-13/16" x 3-13/16" (measuring roof top corner to roof top corner) 3-3/4" high to roof peak. Crown Crate Company O-Scale Kit. This two-building kit has a "flexible footprint", it'll fit just about any space (and can even be broken up into two separate scenes ! ) Measures approximately 8" x 12". Curry's Mercantile What better building could we have chosen to feature on our front cover. This newer gerneration kit allows sophisticated interior views on both floors that add an extra dimension of realism to your model scene. A really cool building that will fit in most period scenes. Buster's A barber shop that actually exists in Evertown, USA. This versitle building is comprise of three structure: Barber Shop, Newstand & Outhouse. Used as one scene or separate for individual placement. Click for more info & ideas. Fensters Farm Fresh O-Scale Produce Wholesalers. Easy to build with lots of extra "goodies" like 30 castings and many super-detail components. O-SCALE SWEATY BETTY'S - Kit comes complete with signs and graphics. Also included are many resin and white metal details parts - even more than its HO version! You get everything you see! Kit measures approximately 5.5" x 12". Crossing Shanty This little crossing shanty comes complete with a coal bin, a stove pipe, laser cut walls & windows. Easy to assemble with extra heavy duty basswood wall panels to help reduce any warping during construction. Bull's Salvage by Bar Mills in O-Scale comes complete with "interior studs", white metal & resin castings, their famous "Insta-Fence" and some cool graphics! Also included are loads of laser-cut details, scrap windows and doors, pallets and stacks of steel girders! However, we must warn you... this kit is a challenge. Amos Cutter's General Store According to Bar Mills, this is one building that belongs as much in the "West" as it does in Maine! The laser-cut "bay window" is what this one is all about, combine that with the generic simplicity of a general store & you have a building that can be used for anything. Witzinger's Washboard Kit O-Scale Kit measures almost 11" long x 8" high and 5" deep. The freight doors are laser-cut, but the windows are injection-molded plastic. A couple different versions of the front sign are included. Shipyard Brewing Company Designed as a "false-front" background building , this kit offers a wealth of detail. From it's laser-cut roof-mounted billboard & cupola to it's large industrial type windows. Measures approximately 14" wide x 6" deep. Saulena's Tavern By special arrangement with Bar Mills, we are pleased to offer Saulena's Tavern. This easy to build kit is also available in S-Scale (BM0202). Production will be limited! The kit includes precise laser cut wooden components, white metal detail casting, signs, etc. Measurements: 6" wide by 11" Long.